The RCom Rs 299 plan is only for prepaid subscribers of the service and is not available to postpaid users. Reliance Mobile, the telecom arm of Reliance Communications, has announced a new prepaid plan for its existing users. The new RCom plan will charge subscribers Rs 299 as part of a special recharge offer. The Rs 299 rental will give RCom’s prepaid users unlimited access to data, calls and texts. With the new plan, Rcom seems to keen on pricing its telecom offerings lower than that of Reliance Jio. 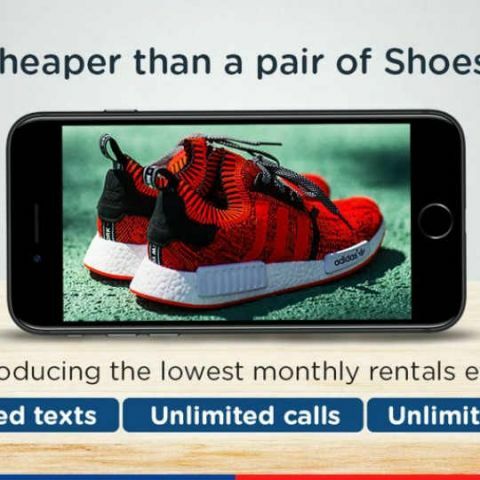 In a tweet announcing the offer, Reliance Mobile teased the Rs 299 plan as “cheaper than buying a pair of shoes.” The tweet is accompanied by a link which redirects users to a prepaid recharge page belonging to the RCom e-shop. Users will need to input their prepaid RCom numbers in order to avail the Rs 299 plan, which means that the offer is only valid for existing RCom subscribers. Reliance Mobile introduces the lowest rates ever! Starting at Rs. 299 monthly rental. There are no other details available on the new plan. When we tried to contact the RCom helpline regarding the same, a customer service agent told us that no such plans have been communicated internally. However, when we placed a second call to the RCom customer service helpline, an agent confirmed that the plan exists, but could not help us with any details on the daily data FUP. Anil Ambani-led Reliance Communications also recently introduces a bundled offer of Rs 5,199, which includes a Reliance 4G data Wi-Pod and a 4G SIM Card. The offer gives users a chance to avail 1GB 4G data for 365 days by paying the Rs 5,199 in installments of Rs 500 per month for 12 months.